in the current vouge catalog, there is 8146.i’m sure it’s not what’s in your head, but there is a hip length, raglan sleeve jacket with round collar, and a deep back pleat, it is a definite swing shape.The dress is just a boiler plate sleeveless sheath with bust and vertical darts. I was pretty convinced that the “hat” was actually her hair, and was going to point that out, but then I put on my glasses, and, well…I liked it better when I thought it was her hair. As a hat, it’s a wee bit terrifying. Good god. I, too, thought that was just her hair, and then saw the comments and looked more closely and saw the Horror. There’s a Folkwear pattern that might be what you want; we’re in Boston this weekend, but I’ll check and let you know. cari, I thought the same thing reading that article. Uh, darts, lining, interfacing? Those are . . . unusual? Although I don’t doubt that the pattern is hard.I was just looking at EmmaOneSock.com, and I saw some faux Persian lamb fabric that would make fabulous trim for that jacket. Tsk, Erin. What’s the matter, Erin? Aren’t you in favour of Cloche Encounters of the Third Kind? I would so wear that hat – regardless of the fact that I’d look like an invading space queen in it. Come to think of it, that’s what I look like most of the time any way, so I might as well have the hat!Black, however, would be the preferred hat colour on my planet.Or a nice red. 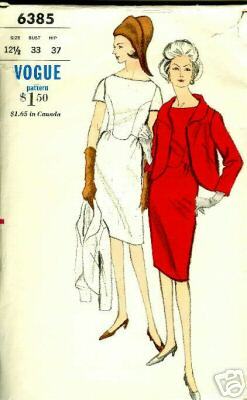 You probably looked at Vogue 8146, but I thought I’d point out that it’s made up on the cover of the new Vogue Patterns. V. cute! But perhaps still not quite what you have in your mind.I had a pattern-in-my-mind problem, but I’ve found a cute New Look skirt that is very close to what I wanted, an 8-gore skirt that flares at the hem. I want a contour waistband, and the pattern doesn’t have a waistband at all, just a facing, but I’m going to use the waistband from another pattern.